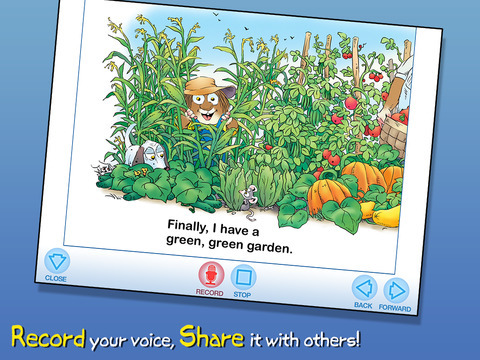 A Green, Green Garden by Mercer Mayer is one of the "I Can Read!" Little Critter titles, published in print in 2011. 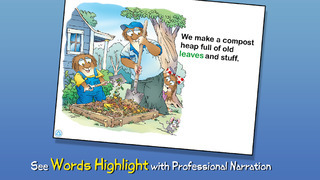 In this title, Little Critter and his family are preparing to plant a garden together. The digital version of this book also adds a new twist, keeping track as the young reader tries to find all 20 of the little mice and spider hidden on nearly every page. 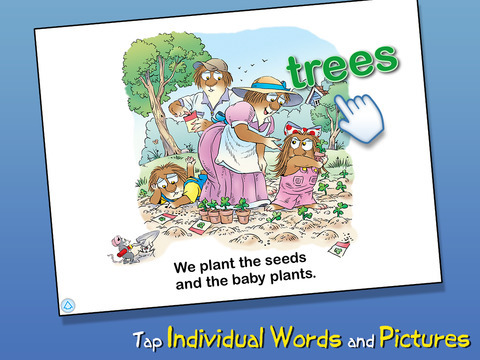 Like other apps by Oceanhouse Media, this book is interactive in a way that enhances early reading skills. Most images (of mom, Little Critter and the people & things around them), will name themselves aloud while the word briefly appears over the illustration. For example, touch a packet of seeds and the word will appear on the screen simultaneously with audio narration. Additionally, the text on the page will highlight if the word is in the story. This provides nice audio-visual reinforcement for early literacy. The app also has great settings, including the ability to record your own narration, turn off sound effects or even to disable the interactive elements. Simple navigation is intuitive with a thumbnail page guide. The delightful child narrator is easy to understand and a perfect fit, since the story is told in the first-person by Little Critter. Featuring all the steps to plant a garden (along with lots of shenanigans), this title will enchant young and old alike.